I read up on another question about this plant and "the growing season" was mentioned. I was curious to know exactly when that is. Also, if winter is around, would it be smart to leave an Oil-Filled heater on near the plant to maintain the 70 degree temperature? What is the best all year round evergreen to plant under conifer trees for ground cover? 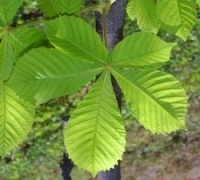 I have 2 VERY large and very old horse chestnut trees in my garden and the soil underneath is very bare (i.e. no lawn will grow there). I want to plant something underneath the tree and have done lots of research on plants for under trees (i.e. lots of shade and possibly also quite dry soil). However I have heard from someone that there is something in particular about Horse Chestnuts that makes it hard to grow anything underneath them. Others say they are just like any other tree. Can anyone shed any light on this? If they are different from other trees can you explain why this is? Does it affect the soil ph? or are there root toxins like with black walnuts? Any advice on what I can do to improve the chances of anything I plant, or on what the best things to plant would be? So far I am thinking of vinca, lily of the valley, snow drops and other bulbs and maybe heathers or some alpines. There is a pretty big area to cover so I don't want to buy masses of plants and then have them all die. Please help if you can. One of my Azaleas has sprouted yellow coloured leaves with brown spots- the others are fine. What is wrong with it and how can I fix it? I live in zone 14 Manteca , CA 95336 can I fertilize Podocarpus trees, bougainvilleas, hibiscus and agapanthus right now. Is it o.k. to plant two plum trees (Santa Rosa & Satsuma) in the same hole in the ground and then prune as one tree? Thanks for your answer could I also ask if and when we could transplant the rudbeckia to a more suitable site. I am growing mustard cabbage and they will all have the same of soil and pots but half 9 seeds will have salt water and other 9 seeds will have sugar water. Which one do you think will grow faster and why? WE PLANTED SOME KALE PLANTS EARLIER IN THE YEAR WHICH WE HAD BOUGHT FROM A NURSERY WE HAD NEVER GROWN THEM BEFORE AND SO WAS A BIT UNSURE WHEN TO HARVEST THEM. HEY LOOKED SO GOOD WE DECIDED TO TAKE A CHANCE AND WE HARVESTED 1 PLANT AND COOKED IT - IT WAS LOVELY(WE HAD NEVER TASTED IT BEFORE) WE HEN LOOKED IT UP IN OUR MANUAL AND FOUND THAT ITSHOULD ONLY BE HARVESTED FROM DEC ONWARDS! !IT LOOKED AND TASTED GOOD TO US WHAT DO YOU THINK? I have a large heap of ashes from my bonfire - mainly burnt hedge clipping, tree prunings, cot down plant material, and want to know if it is beneficial to spread it on either the border, ar on the veg garden. Is Sept. 26 in midcoast Maine to early to divide daylilies?